San Diego, CA- Craig G. Francis will make his third appearance on The Big Biz Show with Bob “Sully” Sullivan. Craig G. Francis has facilitated over 2500 loans in the last 25 years for over One Billion Dollars. Bob “Sully” Sullivan known regionally as the Radio Coalition host on KOGO has an investment background and has done the Big BIz Show for over 17 years nationally. You can search for a local Radio or TV affiliate or just listen/watch online at http://BigBizShow.com. Being on The Big Biz Show makes good sense, apparently past SBA related guests talked in generic terms about the SBA possibilities instead of actual deals, examples and real world advice. The Big Biz Show is a syndicated radio show on 170 radio station, Armed Forces Radio Network, Yahoo Radio and AOL Radio. Additionally you can watch the show on the Biz TV Network as well as Wazillo.com. GOOD NEWS HIDES THE BAD NEWS...PAY ATTENTION! The Good News from the Spin is that according to the Treasury report issues a few weeks ago the SMALL BUSINESS LENDING FUND increased loans by more than 10 percent last quarter. An increase of $1.3 billion over the prior quarter and 84 percent of them increased their lending. The Bad News is that Bloomberg reports that only $4 BILLION of $30 BILLION of the treasury's SMALL BUSINESS LENDING FUND was sent to 332 community banks. ONLY $4 BILLION of the $30 BILLION??? These are really anemic results and obviously there needs to be awareness brought to the improvement of the facilitating of these loans instead of the PR Spin of these anemic results. Craig G. Francis is the owner of Francis Financial and The SBA Loan Store. He has been a top producer of SBA Loans since 1981, and has worked with Dun & Bradstreet and Bank of Commerce. 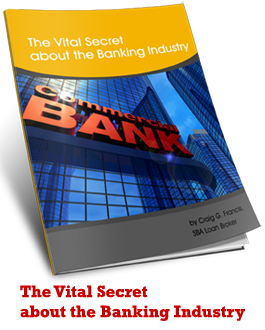 Craig Francis has the expertise to steer clients through the often confusing rules and regulations associated with SBA Loans, having helped over 2,500 businesses acquire over a billion dollars in loans. He can be contacted through CraigGFrancis.com, SBALoanStore.com, onLinkedIn, or at 888-666-9722. Sea Coast commerce bank has announced its unaudited results of first quarter results for 2012. According to the Press Release on Marketwire.. The Bank grew its inventory of guaranteed, saleable SBA loans by $4.4 million during the first quarter alone, which if sold, would have generated an additional $454 thousand in net income in the first quarter. What makes being an SBA Broker effective is my exsisting relationships with the banks and introducing those banks to my clients appropriately. SBA Increases Size Standards in Transportation & Warehousing Sector...Not too exciting. The SBA published a final rule raising the size definition of small business in the Transportation and Warehousing sector. Additionally the also published a proposed rule increasing the size for Health Care & Social Assistance Sector. According to the press releases. Regarding most of the small businesses we work with like restaurants, business owners that want to buy the building that they are in, expanding an existing business, financing an existing business this probably does not apply. Obama’s Proposed Reorganization - Help or Hindrance? government agencies that deal with various aspects of business and trade. The plan would merge business functions of the Commerce Department with the Export-Import Bank, the Office of the U.S. Trade Representative, the Overseas Private Investment Corporation, the Small Business Administration and the Trade and Development Agency. The idea has received both approval and disapproval from members of Congress and business representatives. Obama insists that the move would help business by reducing the number of separate agencies they might deal with. This was echoed by House Speaker John Boehner, whose spokesman Brendan Buck said, “Eliminating duplicative programs and making the federal government more simple, streamlined and business-friendly is always an idea worth exploring.” And on the surface reducing the size of the federal government would seem to be a good idea. On the other hand, many in Congress are skeptical of one or more elements of the plan. Even Buck went on to say, “Given the president’s record of growing government, we’re interested to learn whether this proposal represents actual relief for American businesses or just the appearance of it.” Some Democrats also expressed concern, particularly for Obama’s request for an “up or down” vote within 90 days. According to a Wall Street Journal report (“President Barak Obama Proposes Merging Agencies”), Obama “requested that Congress guarantee an up-or-down vote within 90 days on any consolidation he proposes that would save money and reduce the size of government.” Many in both parties will be hesitant to give him that kind of power. As a first step, Obama has already indicated that he will make the head of the Small Business Administration a Cabinet post, a move that does not require Congressional approval. The President insists that this plan will save $3 billion over ten years, in part through cutting 1000-2000 jobs through attrition. But seriously, how big a dent is this going to the multi-trilliion dollar deficit we have? And is this truly in the best interest of business and the country? According to an article in Bloomberg (“Obama’s Plan for Reorganizing Agencies Hits Skepticism from Lawmakers”), there is concern that the consolidation would actually hurt programs that are currently successful, such as the SBA loan guarantee program and the U.S. Trade Representative’s Office. I fear that this move would give us the type of preference-based lending that led to the real estate crash. My greatest concern, particularly with the SBA, is a return to the type of policies we had during the Jimmy Carter era. During that time period, the SBA made direct loans based on government guidelines, resulting in a 40 percent loss rate. I fear that this move would give us the type of preference-based lending that led to the real estate crash. Do we really need more lending decisions based on race, gender, zip code, or whatever buys the most votes? Remember that these are the same people who are in the process of setting up the Obama Care nightmare, the horribly costly job-killing regulations of the EPA and the many equally intrusive attempts by the Federal government to get involved in the private sector. Imagine Solyndra-like debacles, but with the SBA’s $30 billion in guaranty authority. When you have a group of politically-motivated bureaucrats with no business sense or experience trying to “streamline” perfectly good agencies (and we have so few of these as it is), well, I see this as ending badly. For the last 32 years I have seen attempts to restructure these agencies and nothing came of it. The last time someone did something to help the SBA, Reagan got this agency out of direct loans, with the 40 percent loss rate, and into a bank guaranty program where the losses were as low as 2 percent. From what I can see, the current proposal for rearranging these agencies is going to be about as effective as changing the napkin settings at the tables as the HMS Titanic settled under the waves. In a recent interview on Fox Business News’ Willis Report, Citigroup Head of Small Business Banking Raj Seshadri spoke with Gerri Willis on the company’s pledge to lend $24 billion to small businesses through 2013. It was an interesting conversation, with Ms. Seshadri explaining Citi’s commitment to helping small businesses grow in order to stimulate the economy. Unfortunately, the interview was long on generics and short on specifics, especially when Ms. Willis attempted to pin Ms. Seshadri down on exactly what Citibank was going to do to help small businesses. The interview began with Ms. Willis, whose program focuses on consumer and personal finance issues, explaining that Citigroup had pledged to lend $7 billion in 2011, $8 billion in 2012 and $9 billion in 2013 to small businesses. What was never discussed was Citigroup’s definition of a “small business.” As we have seen from other large banks, the definition of “small” is about as exact as was Bill Clinton’s definition of “is.” The importance here is that businesses at the high end of “small” are often much closer to Mid-size than to what most people consider as a true “small” business. With a larger business comes more relative financial stability, which is much more attractive to large banks who are under strong scrutiny over “risky” loans. However, this does not help the real small businesses that have traditionally been the engine of economic recovery. At another point in the interview, Ms. Willis shared some statistics from a recent National Federation of Independent Businesses survey that indicated that 11% of business owners feel loans are more difficult to get and that 89.3% felt credit standards had become too stringent. When asked for her response to the criticism, Ms. Seshadri said that “might have been true a couple years ago,” and then stated that Citibank was “very actively lending today.” However, once again specifics were lacking. Saying that they “leverage all the programs out there” in order to “get to ‘yes’ to as many business owners as we can,” there was little to her reply. She also seemed to have conveniently ignored the fact that this was from a recent poll. Near the end of the interview, Ms. Willis asks Ms. Seshadri about the business owners who are coming to Citibank and whether they seem to be in better shape. The response is surprising to me as someone who works with small business owners on a regular basis. Ms. Seshadri says that “eight out of ten business owners say that they are healthy.” I’m not certain where she is getting her numbers, but I can assure you that it is nowhere near that positive. Yes, the business owners who have survived the Recession are in better shape than those who did not, but are they “healthy”? Or are they just telling the banker they are healthy in order to improve the chance of being approved for a loan? There was one point that Ms. Willis seemed to have hit a sensitive topic, when she asked her guest if Citibank had “relaxed” the terms of loans compared to the height of the Recession. Ms. Seshadri responded that “as a lender the term ‘relaxed’ always makes me nervous.” She then repeats her platitude about trying to get to “yes” with more businesses. I, personally, would like to have seen Ms. Willis follow this up more aggressively, but instead she soft-balled the next question, asking how business owners get to the “yes” and allowing Ms. Seshadri to turn her answer into a pitch to visit a local Citibank branch. Overall, this interview did not break any new ground or provide business owners with any reassurances about their chance of being approved for a loan. Ms. Seshadri’s comments about trying to get to “yes” for more businesses does not ensure that it will happen. When she says that Citibank has “made if much easier and much simpler for the customer to apply,” that does not necessarily mean that approval will be easier or simpler, just the paperwork. And, as I explained in a previous post, there are requirements banks have to go through on any loan, particularly SBA backed loans. Personally, I have not seen one single Citibank loan approved to any of my clients in the last three years. Not scientific, I know, but not a rousing endorsement, either. The fact remains that businesses need to be able to put together loan applications that thoroughly detail their strengths and minimize any weaknesses they may have. Banks have not “relaxed” their standards appreciably, and that continues to impact small businesses and their ability to expand and create jobs - the jobs the economy needs to get back on track. We do not need to return to the days of lending to anyone with a pulse, but businesses that have survived the economic meltdown need to be rewarded for that, not punished because their numbers are not good enough. If you are looking to start 2012 off by expanding your business and would like an evaluation of your loan opportunities, please contact me. I have over 30 years of experience in the industry and have helped over 2000 businesses with more than $1 billion in funding. I can provide an honest evaluation of your situation and help you to move forward in the most efficient manner. If you are a restaurant owner looking to expand, or if you are considering purchasing an existing restaurant, please view the special video report on this site. 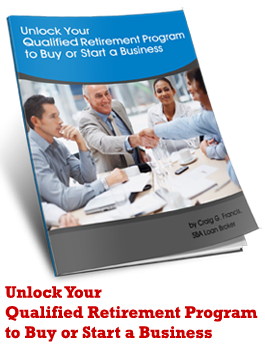 For years, the SBA loan guarantee program has been one of the most effective methods for successful businesses to get a start or to expand. Nearly one-third of all long-term small business loans are backed by SBA guarantees, in part because the terms make the loans more acceptable to borrowers. Long-term amortization periods and lower rates, often fixed for many years, are attractive to budget-minded business borrowers. In turn, this affordability helps ensure the likelihood of repayment, which makes lenders more comfortable. Because the SBA does guarantee a portion of the loans, as much as 90 percent during the recent enhancement periods, banks are more amenable to providing funds. The banks enjoy solid protection, lower risk and higher profits - all factors that provide compelling reasons for banks to loan to small businesses. But there is another element of the process that helps to further ensure the viability of businesses that apply for SBA loans - the element of due diligence. When a business owner applies for funding through the SBA loan program, he or she is faced with a variety of requirement that must be satisfied. These will include loan applications by both the businessperson and the lender, personal background and financial statements, three years (if existing) of business financial statements and a financial projection. These are only the beginning of the process, which can seem daunting to many new business owners, however the committed individual will move ahead. Many business owners feel that the paperwork involved makes the process nearly impossible. This is completely false. If anything, the paperwork is the same or even lower than conventional loan since the loan risks are lower. If you have applied for a residential loan and seen its extraordinary amount of paperwork, the SBA is the proverbial piece of cake. Besides which, if your loan has a 10 year period, this is a small investment of time. In other words, it is WORTH it to do the process. And who knows, you may get approved. Remember, that it is in the best interest of all parties - business owner, lender and SBA - that every possible issue be identified and explained. To further protect both the SBA and the lender, and therefore the most viable business borrowers, recently a new requirement has been added to the application and verification process. By January 1, 2012, all SBA approved 7(a) lenders and Certified Development Companies must sign up for and begin checking the Credit Alert Verification Reporting System (CAIVRS). Just what is CAIVRS and why does my lender need to check it, you may ask. In short, it is a federal verification website that will allow a lender to verify that a borrower does not have any defaulted or foreclosed federal loans, such as student loans. The requirement, known as SOP 50 10 5, became effective on October 1, 2011, but lenders have been given until December 31, 2011, to sign up and be fully compliant. While this may seem another unnecessary step in the process, it is actually one of the few ways the government works to limit its liability. In the 24 years the program has been in effect, it has helped federal agencies avoid billions of dollars in potential losses from loans to individuals who have already defaulted on a government loan. HUD alone estimates it has avoided over $4 billion in losses and another $12 billion in potential claims. So what does this mean for the borrower? First, if you are in good standing with the federal government - as to loans, at least - you have nothing to be concerned about. The duty of checking falls to the lender alone. Second, if you are a responsible business owner looking for an SBA-guaranteed loan, you can feel satisfied that something is actually being done to prevent irresponsible individuals from tainting the application process. Finally, if you are an SBA-approved lender, this gives you one more step in your due diligence process to ensure that any loans you make have the best probability of repayment. If you are a business owner and are looking to apply for an SBA-backed loan, your first step should be to contact someone who can answer any questions you have and help you verify that you are, indeed, on the right track. Not every business owner will be approved for an SBA loan, and not every business owner should even apply. Get your questions answered and your situation evaluated before going through the entire process. If you would like to get an honest evaluation of your position and chances of success on an SBA loan, you can contact me at the sites and/or numbers below. If you are looking to open a restaurant, I encourage you to watch the information video on this site. I wish you a good year end and a successful 2012. Recently one of my colleagues forwarded an email to me with a “letter” supposedly from an actual small business owner to his employees. Being cautious about forwarded material, I decided to look into it more closely and found that this “letter” has been around since mid-2009 with several different names attached to it. But just because we can’t confirm that it even began life as an actual letter, that does not mean that it is devoid of meaning and importance. In fact, I find this one of the most succinct, straight-on explanations of what small businesses are faced with in the current political climate. Treating people who have essentially given their lives to create a thriving company as if they were the enemy -- or worse, an unlimited money tap -- will only guarantee this Recession will not end any time soon. Rather than give you the entire text of the letter (I am certain you can find it online), I would like to summarize the contents and give you my take on what the writer had to say. I hope that you will share your own thoughts with me. The writer begins by addressing his employees about rumors that the company may be in trouble because of the economy. He assures them that the economy does not pose a threat, however the political climate does. He then goes on to detail his “back story” on getting his business started. Having worked with many small businesses - in both the start-up and growth phases - I know exactly what he is talking about. I did my time as a start-up company, and it was not the easiest time of my life. According to the writer, “I lived in a 300 square foot studio apartment for 3 years. My entire living space was converted into an office so I could put forth 100% effort into building a company, which by the way, would eventually employ you.” He goes on to talk of existing on Ramen noodles, driving a beat up old car and staying home working while friends were out partying: “I was married to my business -- hard work, discipline, and sacrifice.” This is exactly the type of experiences many successful small business owners go through as they are getting their companies off the ground. And how is our business owner expected to bail out these folks? Why, through taxes, of course. “I am being taxed to death and the government thinks I don't pay enough,” he says, and then goes on to provide a list of the types of taxes he is expected to pay. According to our writer, he sent $288,000 to the U.S. treasury just in one quarterly tax payment. On top of that, he points out, he has to pay taxes for employing someone to manage all of these taxes. And instead of spending time thinking about how to improve the company, most of his own time is spent dealing with all of the government mandates and regulations. Who actually stimulates the economy? So where does this leave our business owner? Frustrated and fed up with the situation, to say the least. And what does he plan to do about the situation? “It's quite simple. If any new taxes are levied on me, or my company, my reaction will be swift and simple. I fire you. I fire your co-workers...Then, I will close this company down, move to another country, and retire.” Now, I don’t believe that every small business owner feels this way, but the anger is out there. I see it every time I talk to owners who are trying to keep their companies alive amidst the regulations and taxes. This economy is not improving, despite what Washington has been saying for the past two years, and it will not get any better until business owners are treated like the heroes they are instead of villains. What we need is people who know the top of a balance sheet from the bottom. We need people who understand the reality of the relationship between successful businesses and the economy. Treating people who have essentially given their lives to create a thriving company as if they were the enemy -- or worse, an unlimited money tap -- will only guarantee this Recession will not end any time soon. Unlike the supposed business owner, I don’t plan to head to the Caribbean any time soon. There are too many good businesses out there that need someone who can help them through the process of finding money to grow and thrive, and that is something I am good at. I have been in this game for over 30 years now, and I enjoy what I do. But if Washington continues along the road it has been on recently, the Bahamas might begin to look more inviting. The numbers are in, the “winners” have been chosen, and in this case there doesn’t even seem to be much left to shout about. After the usual hype and ballyhoo, President Obama’s much vaunted Small Business Lending Fund has ended with what Thomas K. Brown described in iStockAnalyst.com as “a thud.” Out of a total of $30 billion dedicated to helping community banks make loans to local small businesses, only about $4 billion was actually disbursed to “qualified” institutions. When the program was rolled out, it was touted as a way to get banks to invest in small business - traditionally the engine of economic recovery. The SBLF would provide qualified community banks with funding at rates as low as 1% if certain benchmarks were reached in lending to small businesses. One of the main problems, however, was the very issue of what made a bank “qualified.” Many banks that applied said that they had to deal with very confusing guidelines on what the Treasury Department wanted. Then, once they had waded through the paperwork, most of them were still declined - even banks that had been judged “well-capitalized” according to Lawrence Kaplan of Paul Hastings Janofsky & Walker LLP in an article in Bloomberg. According to a Fox Business report, there are approximately 7400 lenders that fit the Small Business Jobs Act’s requirement of less than $10 billion in assets. Out of that number, only 933 actually applied for funding through the SBLF - for a total of $11.8 billion of the $30 billion available.By the time federal regulators and Treasury officials had finished, only 332 were actually approved for a total of $4.3 billion, about a 36% rate of approval. As late as three weeks before the program ended on September 27, the Treasury had declined 59% of all applications. So what did we get for all the effort? On the positive side, some money has gone out to small businesses through the SBLF program. According to Bloomberg and Fox Business, banks such as Seacoast Commerce Bank in Chula Vista, Calif., and Bank of Montana in Missoula, Mont., plan to provide local businesses with needed funding. This is important, as banks that receive SBLF money are required to show increases in their small business lending. An increase in 10% in lending would make the bank eligible for a 1% interest rate on the funds received. A failure to increase loans would result in a higher rate, up to a 9% maximum. However, it is not clear that the increased money will actually be going to new customers. In the Bloomberg article, John Dalby of Redwood Capital Bancorp of Eureka, Calif., admitted, “We met our 10 percent target and expect to do more, but, frankly, a lot of the customers we get we steal from the others.” In other cases, the new loans banks made “ are probably going to be refinancing the loans that were made by other institutions,” said First Federal Bank of Florida (Lake City) CEO Keith Leibfried in Bloomberg. Even more distressing is the fact that 89 of the first 191 banks approved used at least a portion of the money to pay back funds received in the TARP bailout. So the government in effect handed out money it had to borrow so banks could pay back money they had borrowed from the government in the first place. This does not seem like a wise use of money, borrowed or otherwise. Some economists and industry members insist that a large part of the overall problem is that “credit-worthy” businesses are not applying for loans, and this is in part true. Many businesses - the ones that did not fold during the early part of the Recession - are not in a position to qualify under federal regulators’ definition of “credit-worthy.” Because of high unemployment (stubbornly remaining at 9.1%) and the lack of real recovery, these businesses have not posted the income numbers that regulators want banks to accept. Thus, they are deemed “poor risks” even if they have never defaulted on a loan or closed a location. Additionally, many other businesses are refusing to take any chances while the economy is still weak and long-term regulatory issues are unresolved. Moving forward from here is going to continue to be a slow process. There may be some resolution on coming regulations - for good or ill - when the Supreme Court takes up Obamacare in the near future. But that is only one issue that is holding back businesses. With large elements of the government still in favor of increasing taxes on the “wealthy,” many small businesses will continue to hold back from expanding (read “hiring more workers”) until they know they will be able to afford keeping new hires on the books. If you are one of the rare businesses looking to expand and are interested in either a conventional or SBA loan, be sure to get some straight answers before you make a move. With over 30 years in the industry, I have the experience to give you the information you need to make a decision on funding and the connections to help you move forward. If you are considering purchasing or expanding a restaurant, please be sure to watch the special video on this site. Join our email list and you will immediately receive two free reports and a video interview showcasing a restaurant, tavern sports bar & bowling alley funded with an SBA Loan. Why an SBA Loan Broker? Craig G. Francis originally worked a a lender for 12 years. He then saw a need for the entrepreneur to have someone on their side who spoke the language of banking and could facilitate the deal. Over 2500 loans and a billion dollars of funding later this is the guy you want on your team. As you search through SBA Loan related-sites you may drawn towards a site that will ask for a submission fee, that is a warning sign. In reality you may not be ready to apply. SBA Loans can be used for start-ups, expansion captial, refinancing loans, buying a business, buying an owner user building. * A capable first rate team. Before you spend any money you should know if you are qualified. WHAT'S NEXT? If you are interested in having a talk with Craig G. Francis about brokering a loan then call him directly at 1-888-666-9722. If you want to do more research take a look at our sister sites. CraigGFrancis.com. We want you to make an informed decision and we hope that this page can inspire you see how your project can benefit from an SBA Loan. We invite you to download 2 Free Reports by filling out the form on this page and we will be in touch.